If there’s one thing that my kids love it’s food they can pick up with their hands. In fact, Kenya would be more than happy to never use a knife or fork another day of his life. If he can get away with figuring out how to eat a dish with his hands instead of a fork he will happily do it! Instead of getting frustrated by this fact I try to turn the negative into a positive by creating flinger lickin’ good dishes like Baby Frittatas, Spinach Ricotta Bites, Banana Bites and these little beauties. We eat at a delicious Vietnamese restaurant in our neighborhood called Gingergrass and part of the fun of dining there are all of the dishes that don’t require cutlery. 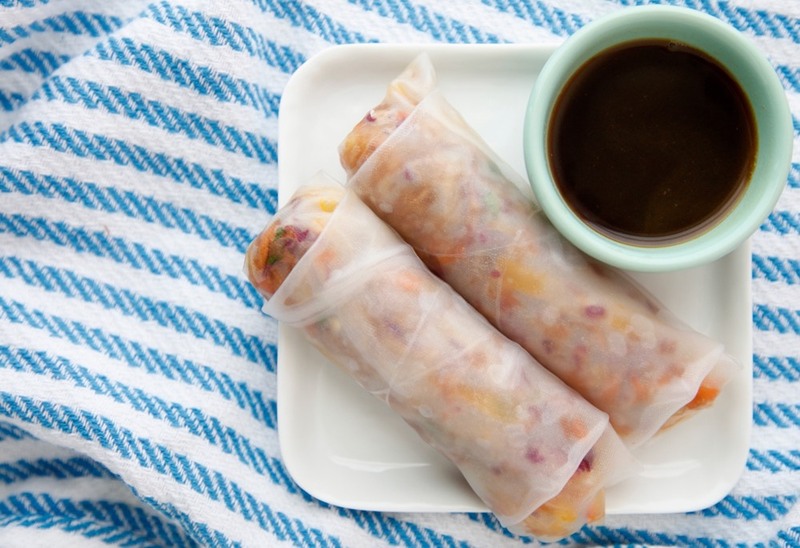 One of the kids favorites are Bo Bia rolls which are all kinds of vegetables wrapped up in rice paper. My simple version are these Asian Slaw Spring Rolls. They’re filled with a crunchy vegetarian slaw and irresistible dipping sauce. For the recipe I include gently steamed fresh shrimp, but you can leave them out or even substitute tofu as I do for Kenya as he’s a proud vegetarian. 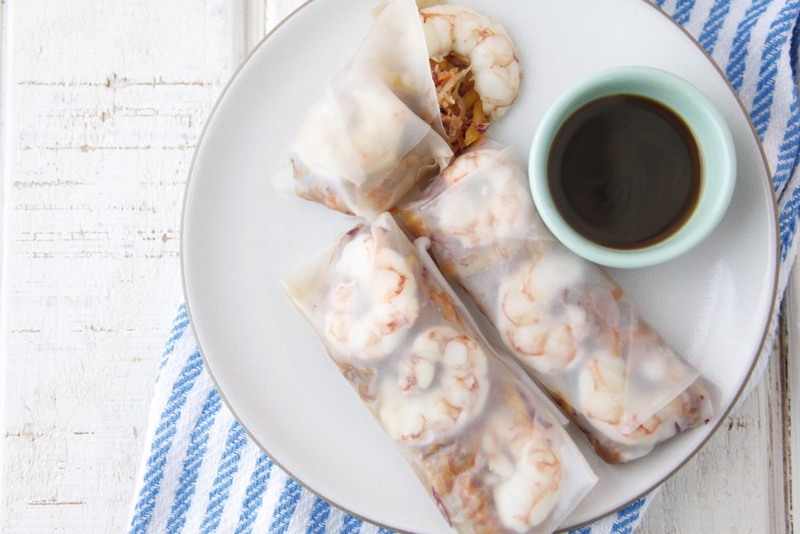 If you’ve never tried using rice paper rolls, don’t be intimidated. They’re much easier to use than you might think. You just gently add them to water to moisten, lay them on a flat surface and top with the tasty slaw and shrimp before gently rolling up and voila! You have a simple late summer recipe to enjoy with your hands. Less to wash, unless you consider those cute little fingers! 1. Place first 5 ingredients in a bowl and mix to combine. 2. Place the grated radish in several layers of paper towel and squeeze out excess water. 3. In a large bowl, place all vegetables and toss. 4. Pour 2 tablespoons of the vinaigrette into the bowl and toss to coat, reserving the remaining sauce for dipping. 5. 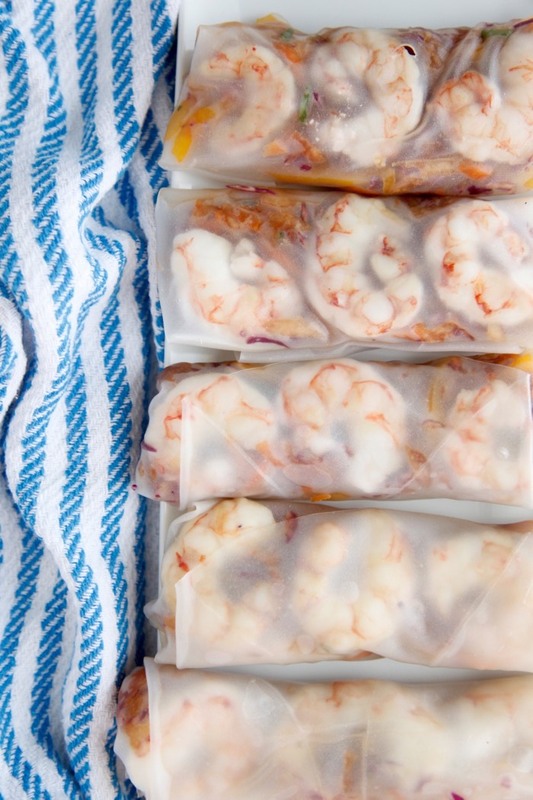 Slice the shrimp in half lengthwise. 6. Place the rice paper wrappers, one at a time, in a bowl of warm water to soften for 20 seconds. 7. Place the rice paper wrapper on a cutting board or clean surface and blot with a paper towel or towel to remove some of the excess water. 8. Place 4 shrimp, rounded side down, on the rice paper and top with 2 tablespoons of the slaw. 9. 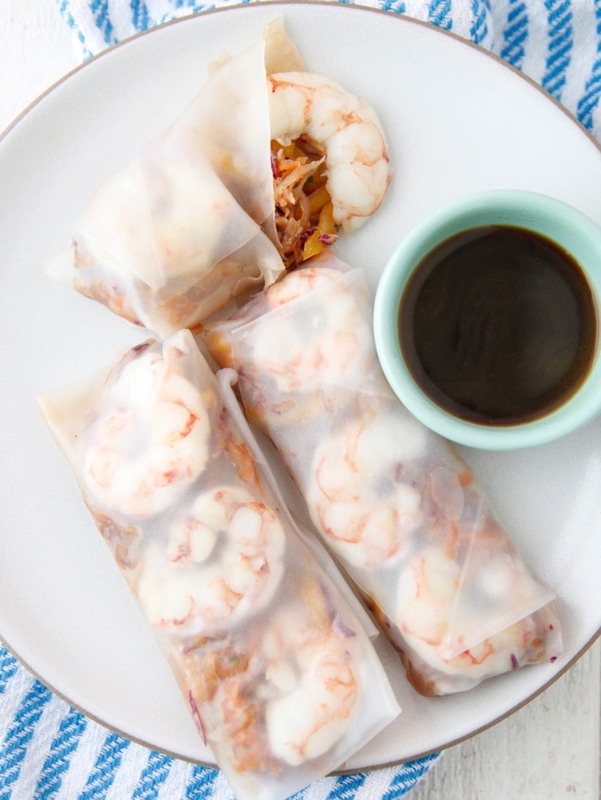 Roll one side of the rice paper over the slaw into a cylinder and then fold in the sides and continue rolling into an \"egg roll\" shape. Looks so delicious! This might be a silly question but do you think they'd freeze well? My daughter would love this for lunch at school..
To sub with tofu, do you marinate, bake, pan fry, season, etc.? These look delicious! 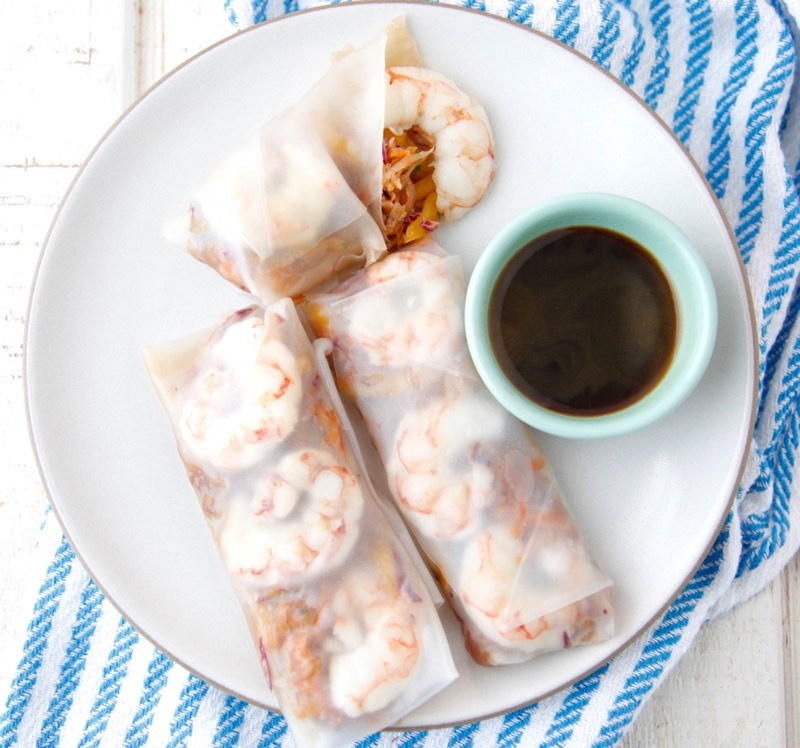 I've never worked with rice paper wrappers before but I love the ideas of making spring rolls at home! These look delicious! And kind of a fun family project to boot!! My husband and I loved these! My five kids were not as big of fans. I just made it again this weekend with extra dressing and chicken instead of shrimp to eat as a salad rather than spring rolls. Yum!